The other day, we told you about Oppo's new phablet, the Oppo R7s. Today, a premium version of the phablet has been certified in China by TENAA. The Oppo R7s Plus features a 6-inch AMOLED screen, with a 1080 x 1920 resolution. An octa-core 1.5GHz CPU is under the hood along with 3GB of RAM. 32GB of non-expandable storage is inside. The camera combo from back to front weighs in at 13MP/8MP, and a 3070mAh juicer keeps the lights on. Android 5.1.1 is pre-installed, although there is a chance that Android 6.0 will actually be on the phone right out of the box. The Oppo R7s Plus measures just 7.75mm thick, and tips the scales at 200 grams. Buyers will have the option of picking up the device in Gold or in Silver. Pricing is unknown. The Oppo R7s Plus supports 4G LTE connectivity. A fingerprint scanner can be seen on the back. The Oppo A33m carries a 5-inch display with a 540 x 960 qHD resolution. A quad-core 1.2GHz CPU drives the handset, with 1GB of RAM inside. The device offers 16GB of internal memory, and for those seeking additional storage, there is a 128GB capacity microSD slot on board. An 8MP rear-facing camera adorns the back of the phone, while a 5MP shooter graces the front of the unit. Android 5.1.1 is pre-installed. 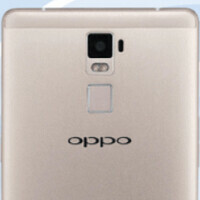 The Oppo A33m will be available in Gold, and pricing is unknown for this model as well. Doesn't Lew from UnboxTherapy have this? And its the 615. Nothing to write home about.